Yawn. 11pm on Sunday night. Possibly the worst time of the week, ever. Not only is the weekend officially over, but Monday morning feels closer than ever. I've just arrived home from another weekend at home. I know what you're thinking: You go home a lot! And I do, I admit it. But it's only a few hours away, many of my best friends live there, my parents, in-laws, sister and nieces live there. So I take advantage. Besides, this weekend, there was an occasion. My lovely Mama turned 59 on Friday, and her beau and my Uncle Bob threw her a surprise party in Burlington, Iowa—a sleepy little town on the Mississippi River. I took the Amtrak into town, where my sisters, brother-in-law and Bob met me, and we headed to Bob's old haunted mansion for a beer before the festivities. View of the Great River Bridge over the Mississippi. When I say old haunted mansion, I'm not exaggerating. 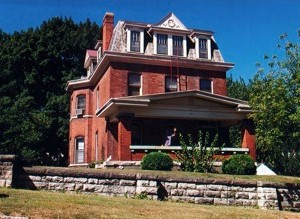 Bob literally lives in this HUGE old house that used to a doctor's office back in 1880. Needless to say, there are several "souls" that have been known to linger around the house. Once, my mother was staying there and in the middle of the night, she woke up to the corner of the blanket being lifted off the bed. Bob frequently sees ghosts standing at the end of his bed. And recently, Bob found a grave marker in the cellar of the house of one Phillip Kreichbaum. He died on February 13, 1935, aged 19, of a heart attack. Bob did some research, talked to some folks who have seen the ghosts in his house, and they all describe the ghost that yells at them out the windows matching Phillip's description. Perhaps the creepiest story Bob shared was that once, a young child prodigy was over at his house with her Dad, playing piano for my Uncle, who's a musician. She went upstairs to use the bathroom, and she came down asking if she could use the old rocking horse upstairs (which happens to be ours from growing up). Bob said of course and told her she was welcome to anything in his house. She replied, "The man upstairs told me I should ask for permission." funky lamps & mannequins, the old rocking horse and a painting of beautiful Grandma Gert. So, anyway, we headed to a nice dinner and then hit the bar for the party. As I mentioned, my Uncle is a fantastic musician, and he and his band were playing as another surprise for my mom. Bob and the Blue Sky Boys. In true form, my mom walked in half an hour later than she was supposed to. Rather than yell "Surprise," we just let my mom walk in and realize that she knew everyone in the bar. She walked in, strolled right past her best friend and son-in-law, and recognized some of her good friends, also in from out of town. I couldn't wait any longer so I of course came running out from my hiding spot and attacked her. 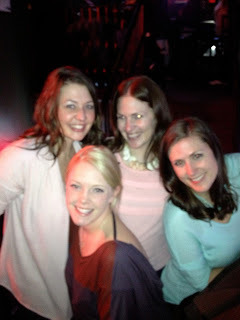 My sisters joined me and only then did she realize she knew everyone in the bar! Such an awesome moment. 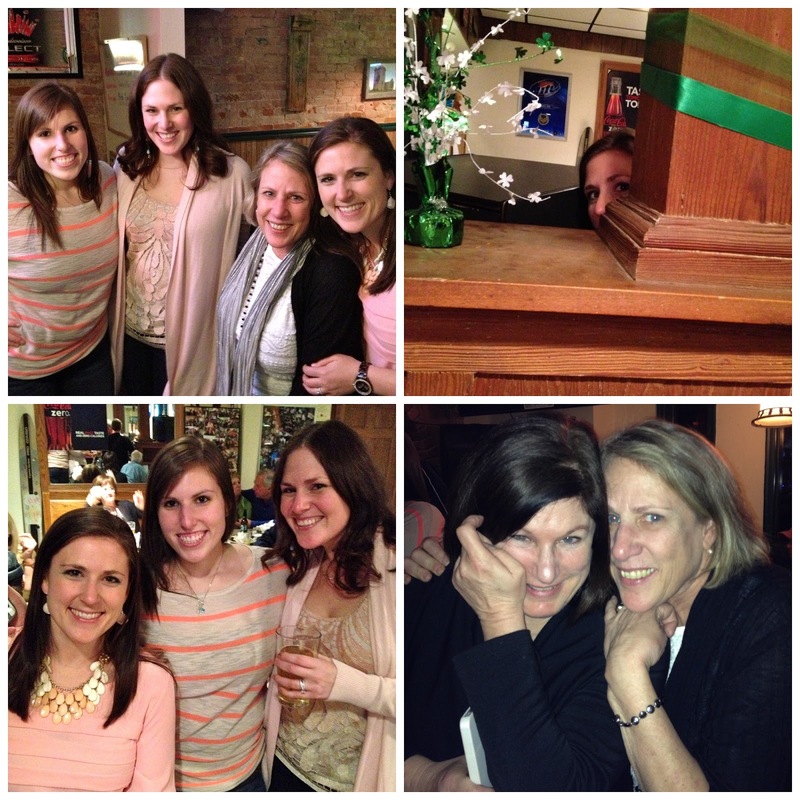 Mom + Sisters, me hiding, and Mom & her BFF! Saturday, I played with Sloanie before having lunch with my girlfriends, and spending the afternoon with my Britt Britt. We had a nice Mexican dinner with my Dad and Denise and my girls and I had an ambitious plan for a night on the town! My mama friends got babysitters and we were ready to let our hair down like the good old days. Not great quality, and we're missing SJ! They call them the "good old days" for a reason, folks. For some reason, when you're 29 and at a college bar, the cute new sweater you're wearing seems a little fuddy compared to the mini-skirts and see-through shirts the girls next to you are wearing. The $2 Big Beer doesn't taste as good as the glass of Sauvingnon Blanc you'd rather be drinking. You're no longer OK with sitting on the toilet seat at the bar for fear of what's been there before you, and the minute the clock strikes midnight, you're outta there like Cinderella. All that said, the girls and I had fun, if not for the scene, for the company. And we got a few good laughs, in too! Finally, I ended the weekend with a nice brunch with my mom, aunt and sisters, and a visit with Dad and Denise. Originally, I planned to take a 7pm bus home, but the weather was horrible—foggy, rainy and snow on the horizon—I rushed to make a 2:40pm departure. An hour later, still waiting for the bus, we came to find out that it left Des Moines at the same time it was supposed to leave Iowa City. In true fashion, mom and I thought the logical thing to do was go have a beer while we waited, and finally, at 530pm, the bus was on its way. And here I am. What about you guys? 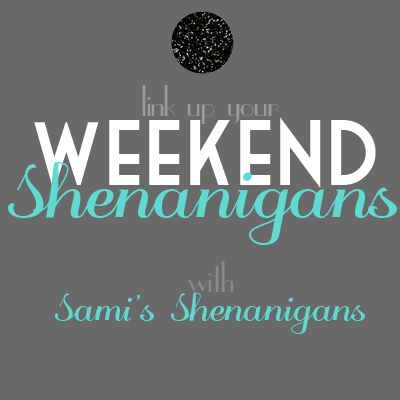 Any fun stories from the weekend? See you tomorrow for the Bachelor Recap!! What an awesome weekend! Your mom is too cute and you are all so sweet for throwing her the party! Finally, I'm super jealous you can take the train or bus home. While I'm only a 6-hour drive or quick flight away, it's still a little long for a weekend! 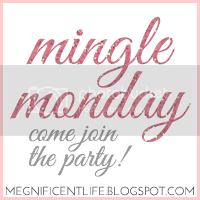 So glad I stumbled upon your blog via the link-up! That surprise for your mom sounds perfect...I love the idea of just filling a bar with people someone knows and then just waiting for them to figure it out. Have a great Monday! how sweet! That house is gorgeous, but it looks scary! Sounds like a great weekend! I went to college in Iowa and pretty much go back every chance I get! Happy Birthday to your momma! I cant believe your Uncle lives in a haunted house. I could not deal with it. I get sppoked out by the ice machine in our freezer. What a fun weekend!! New follower through Sami's linkup! Found you through Sami's Shenanigans. That is the sweetest story! I love that you guys didn't yell surprise but let her figure it out. I've never heard of that before but it's really cool! And your uncle's house is so awesome! Creepy but awesome lol!